On an indoor grill plate or large sauté pan, grill peppers and onions together with olive oil until soft and browned. Add salt and pepper taste. While peppers are cooking, in another shallow pan, add about ¼ cup water. Bring to boil and add sausage. Reduce heat to medium high and cook sausage, turning gently, until water is evaporated and sausage has white color. When water has evaporated, poke holes in sausage with toothpick or thin skewer. If sausage is lean, you may need to add small amounts of water. The juices and fat from sausage will create a brown caramelized glaze on the outside of sausage. Do not boil sausage! 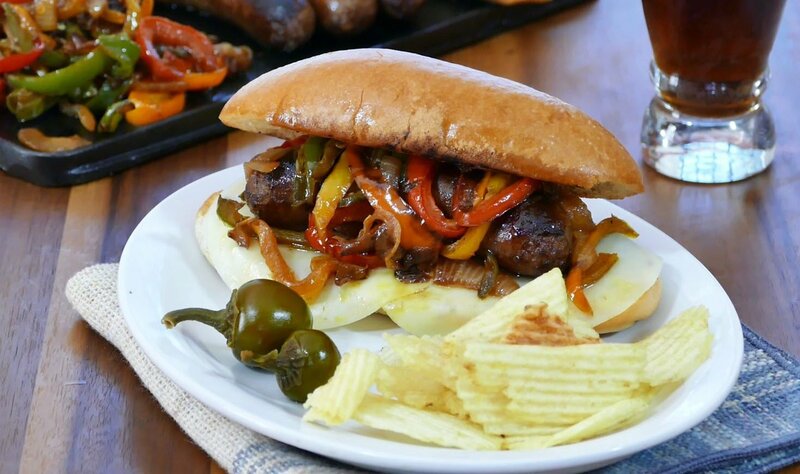 Serve sausage, peppers, and onions on a roll or over pasta. #1 Look for an Italian sausage with the classic course grind. You should see little bits of fat, which will render off and add flavor. #2 Don’t boil Italian sausage. You’re losing flavor that way. Instead, pre-heat oven to 350 degrees. Place sausage links on a baking sheet. Cook for about 15 minutes until links turn a grayish color. Finish them off on the grill, about 5 minutes. This ensures that the links are cooked inside and caramelized on the outside. #3 To cook sausage in the frying pan, start with a small amount of water, about 1/4 cup per four links. On high heat, cook sausage until water has evaporated. (At this point, sausage will be light in color) Gently puncture sausage in a few places to release juices. Reduce heat to medium high and cook sausage until caramelized. Turn occasionally for even cooking. You can also cook up the sausage with a little bit of oil in the pan. #4 Slice up sweet yellow onions pinwheel-style and strips of green or red peppers. (I do two parts onion to one part peppers.) In a frying pan or flat grill, cook in a small amount of olive oil or butter until soft and tender.